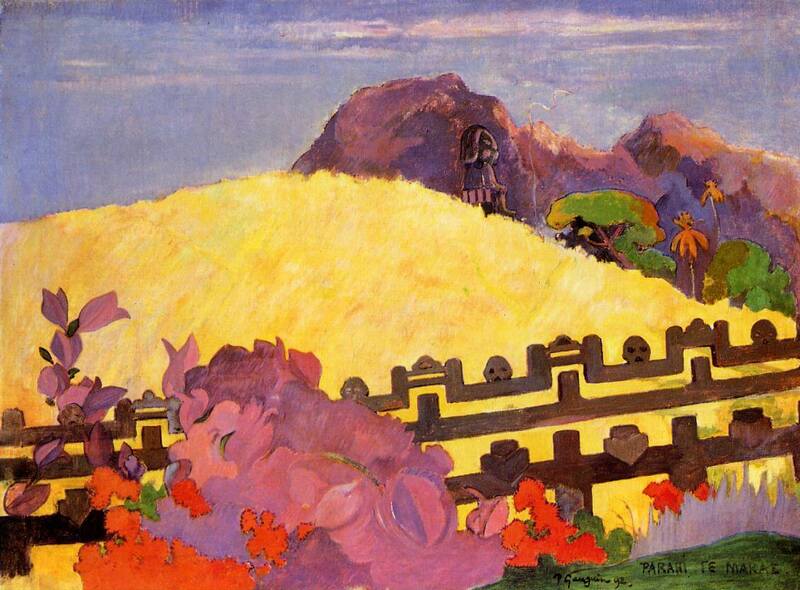 "My artistic center is in my head," wrote Gauguin to his wife, from Tahiti, in the year this picture was painted. And years later he was still insisting: "I am not a painter who works from nature. With me, everything happens in my wild imagination." No picture bears him out more than this strange composition, put together out of Maori legends (or his interpretation of tliem), his notion of primitive religion and the cult of the dead, decorative motifs from the East, and a synthesis of the luxuriant nature that surrounded him. How does this silhouetted fence, with its mixture of primitive skulls and refined decorative forms from Asia, appear in a wilderness dominated by a distant idol? These motifs have never been seen together. But here they belong together, because together they create the sacred enclosure, an Olympus bathed in light and somewhere above the world of men. The baleful fence tells us we are shut out from it, and mortal, but the bright flowers remind us that this is still a world of life and lovely color. The painter has mixed flat surface and rounded forms, pure tones and chiaroscuro, outline and modeling. He has created a picture superficially inconsistent in both observation and technique, held together by the power of the imagined concept, expressing its philosophy through its abstraction.